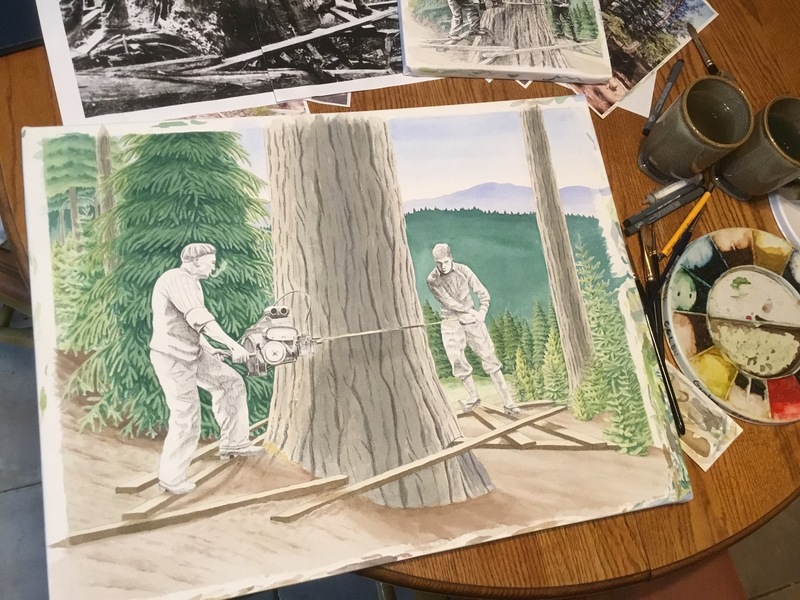 This entry was posted in Forestry, Pen and Ink, Watercolors, Watercolour and tagged Forester Artist, forestry, loggers, pen and ink, Pen drawing, timber, timber fallers, timber fellers, watercolor, watercolour by foresterartist. Bookmark the permalink. Thanks for the sneak peek. I love the action here. A little history too. It’s wonderful that you and Mary participate in this friendly art competition. All the best to both of you. Super work and so very detailed and descriptive. Thank you so much Holly! The auction results are in. Wow! It’s turning out just beautiful! Can’t wait to see the finished painting! I’ll send instructions. So start sharpening you double-bit ax. Sorry, I only have a single-bit one. Can I use that? Sure you can, but you’ll have to stop and sharpen it twice as often. Nice work — I don’t know how I was “dropped” from your follow…. but reupped! Thank you Katie! I’ve had that happen too. Several times as a matter of fact, weird.